A broken rib can be a frustrating injury, because there just isn’t a lot that you can do for it to help it heal more quickly. However, there are a few ways to help ease the pain of a rib fracture, prevent further complications and get back to normal activity. Broken ribs usually occur from trauma to the chest, such as from a fall, motor vehicle accident or impact during contact sports. Most people who suffer a broken rib actually have a cracked rib, according to the Mayo Clinic. Cracked ribs aren't as potentially dangerous as ribs that have been broken, since a jagged piece of bone could damage major blood vessels or internal organs. 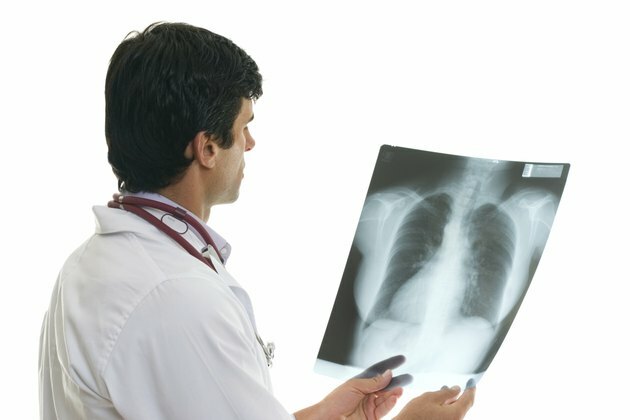 Unlike an arm or leg break, a broken rib isn’t set in a cast. Instead, the ribs are left to heal on their own, and can take up to six weeks in the case of fracture, and 12 weeks or more if the rib has been torn from the cartilage, according to the Better Health Channel. In the past, doctors would wrap the injured area to help splint and immobilize the area, but are no longer used because they can keep you from taking deep breaths, which can increase the risk of pneumonia. Doctors typically prescribe over-the-counter pain medication such as acetaminophen or ibuprofen. If the pain is severe, a doctor may prescribe stronger pain medication or suggest injections of long-lasting anesthesia around the nerves that supply the ribs. While you may not want to take pills, it's important to obtain adequate pain relief because if it hurts too much to breathe deeply, you may develop pneumonia, according to the Mayo Clinic. Rehabilitating a broken rib starts with getting adequate rest and avoiding sports and activities which increases pain in the area, according to Physio Adviser.com. Depending on your job and the severity of the injury, you may need time off work. The use of ice packs may help to reduce inflammation in the early stages of the injury. The area should not be wrapped or otherwise compressed, and deep breathing exercises are encouraged to prevent localized collapse of the lungs. Once you are pain-free, you may gradually return to sports and other activities that were aggravating the broken rib. Additionally, you may perform shoulder blade squeezes, as described by Physio Adviser.com. Squeeze your shoulder blades together as far as possible without pain. Hold for 1 to 2 seconds and repeat 10 times, provided there is no increase in symptoms. Can I Still Work Out With a Fractured Rib?